We’ve been blogging about a live school roof refurbishment over the summer; the site was set up, we were ready to go, and the first step was to strip the roofs we are going to repair and replace. This post is about what happened when we began stripping the boiler room roof at our Academy in West Yorkshire. What happens if it rains whilst you’re stripping the roof? Whilst you are replacing the school roof, even during the summer holidays, surely there is a risk that it might rain and damage the building underneath? This is a commonly asked question – the solution is simple. In this project and virtually all school roofs we work on, the contractors simply strip the area of roof that they can make watertight on the same day. We stipulate this in our specification, which sets out how the project will proceed. Indeed, because we only use experienced roofing contractors, they would only strip what they can make watertight as a matter of course. Of course the contractors also keep an eye on the weather reports! Our specification also calls for a robust Vapour Control Layer (VCL) which is temporarily waterproof for periods of heavy rain – this ensures in the event of an unexpected shower, no water will enter into the school buildings. If we must strip large areas, some workers strip and others put down the VCL as they go. More about VCLs and why they are so important, in our next post. On a very large project where the roof may have to be uncovered for a long time, it might be necessary to erect a temporary scaffolding roof over the roof area, but this is expensive and unnecessary in all but the largest, most complicated school roof projects. Here is the school boiler room roof with some of the covering stripped off. It is a typical traditional 1960s construction. The top surface is a layer of limestone chippings, on top of two layers of ‘bituminous underlay’ – roofing felt is a more common name for it. The bituminous underlay is the waterproofing layer – this is what prevents water entering the roof structure when it falls on the roof. The limestone chipping top surface used to be used for two reasons. Firstly, the chippings provided some fire protection – they reduce the rate of spread of fire across the roof, and secondly, they provide protection against UV damage from the sun, thereby prolonging the life of the roof. Under the bituminous underlay there is a layer of fibreboard insulation, which is a low-cost insulation material made of wood fibres. In the 1960s, heat loss was not considered a major issue as it is today, energy was much cheaper. When we replace roofs like this it is therefore normal to provide considerably more insulation than would have been installed originally. More about that in our next post. The insulation has been laid over a Vapour Control Layer (VCL), which as the name suggests is designed to stop water vapour travelling up through the roof insulation from the warm rooms below. VCLs are extremely important in a ‘warm roof’ like this – that is, a roof where the waterproof layer is laid over the top of the insulation. In this case, the VCL is another bituminous membrane, which was installed to meet the old British Standard BS747 for vapour control. The VCL was laid directly onto a profile metal deck, made of steel sheet formed into ridges and furrows, so as to provide the structure of the roof, spanning from one side to the other. The deck provides the structure which holds up the roof materials and transfers the weight of them and the water or snow sitting on the roof, onto the walls. On larger roofs the deck will be supported on joists or beams, but here it spans simply from one wall of the boiler room to another. By stripping the roof, we can check for structural integrity – is the roof structure able to hold up the roof, or is it damaged or altered in any way? We also check the deck when we take our core samples during the survey process. Look at this photograph of the stripped back roof showing the metal deck. If you look carefully you can see that the bottoms of the profiled metal, the ‘troughs’ or ‘drops’, have rusted away in places. This is due to water sitting in them, which appeared due to the waterproofing layer failing. 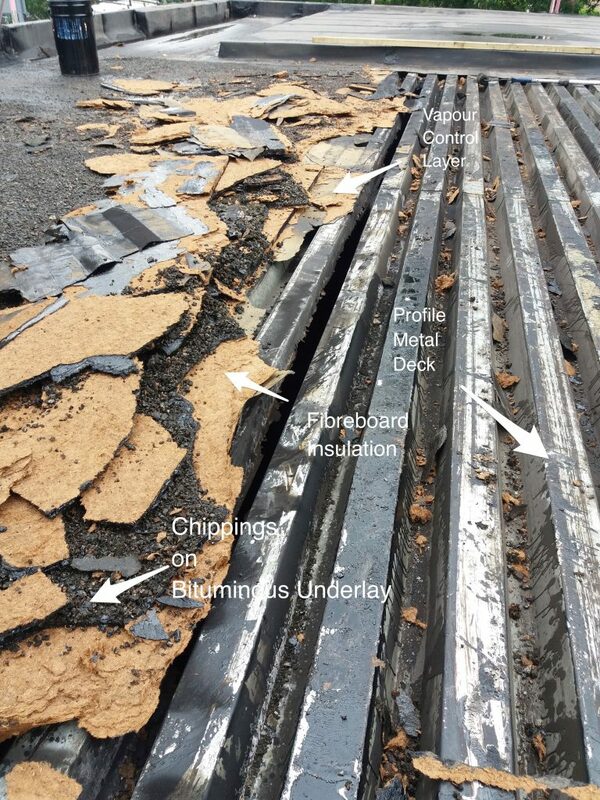 Because this roof deck has rusted through in places, the roof is no longer structurally sound, and walking on it is very dangerous. Fortunately, we carried out our Health and Safety procedures and our contractors are prepared for such eventualities, but remember that walking on a flat roof is not necessarily safe to do! When roofers lay a metal deck to falls – that is, to create a slope in the roof for water to drain away, the deck ridges and furrows should span down the fall, so that any water that enters the construction runs down the drops and can drain away. Every metal deck we inspected at the school has been laid the wrong way, so that water that entered, instead of draining down the fall, sat in the troughs, causing the metal to sit in water and rust. Had the deck been laid properly we would have been able to save the deck rather than replace most of it. 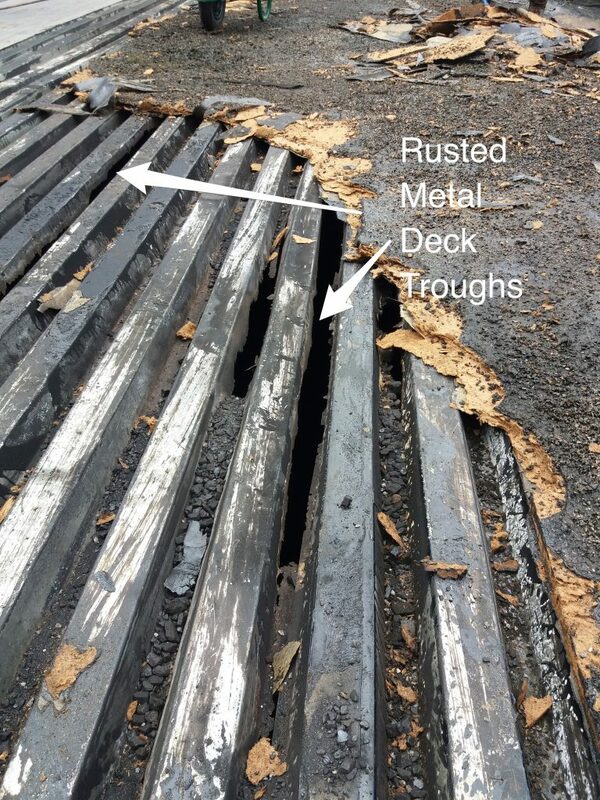 If we had not been aware due to the core samples we took during our survey that the decks were laid incorrectly, the school might be facing additional costs to repair or replace the decks. If an academy receives a certain budget and then other problems are unearthed then the Academy would usually have to find the money for additional works. This is why good quality professional roof surveys are carried out to uncover as many potential problems as possible. Having discovered during the core sampling process that the decks were laid incorrectly, we made provisions in the tender process to cover for deck replacement or repair. This meant there were no unexpected surprises and no additional costs to the school. In our next post we’ll look at the installation of the new roofs, and compare the modern technology for flat roofing with the traditional techniques we have seen here. Don’t forget to sign up to receive the next instalment using the form below – and you can always ask us any questions in the comments section or via our contact page.